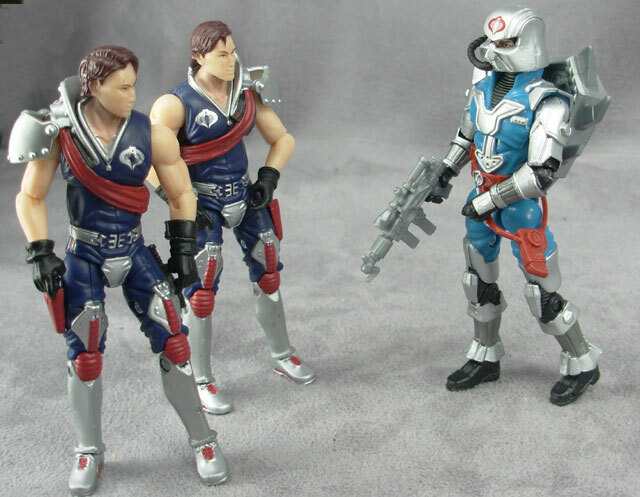 Every so often I turn one of these reviews into a “Joe confessional” and reveal a dirty little secret about my G. I. Joe fandom. 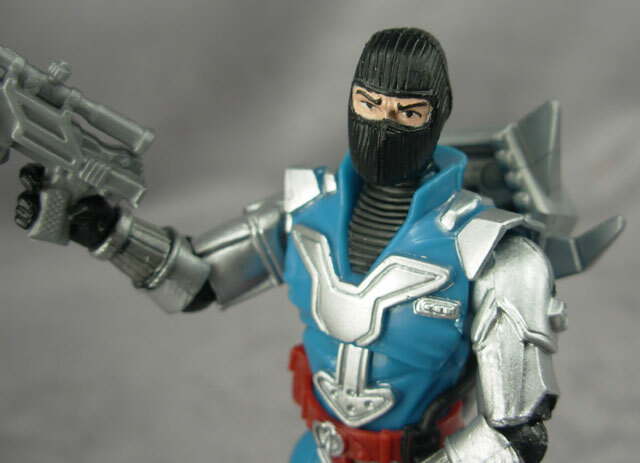 For this review, it’s only fitting to state that I was never a fan of the Battle Armor Cobra Commander figure as Cobra Commander. The first time I saw the figure as a young Joe fan, I questioned the sanity of the designer who produced it. This wasn’t Iron Man—this was the leader of the a ruthless terrorist organization determined to rule the world! Where was the hood? Where was the featureless face plate? 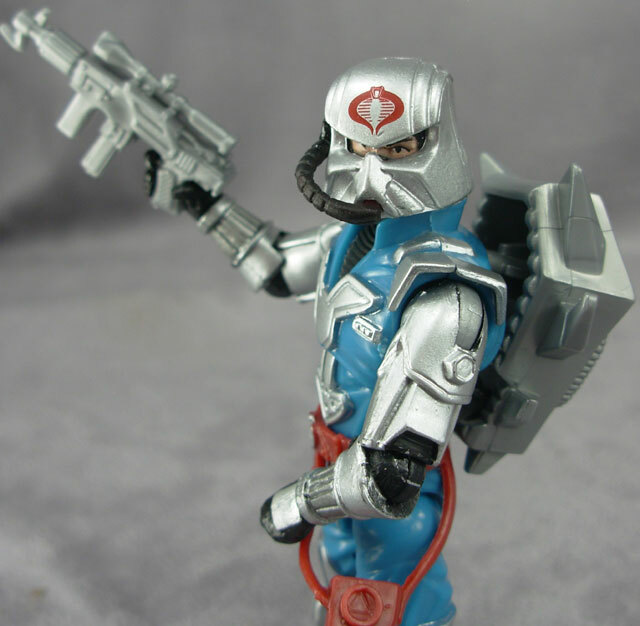 It wasn’t until Larry Hama penned the character design into the comics—making it Fred VII impersonating Cobra Commander that I could accept the character into my G. I. Joe mythos. 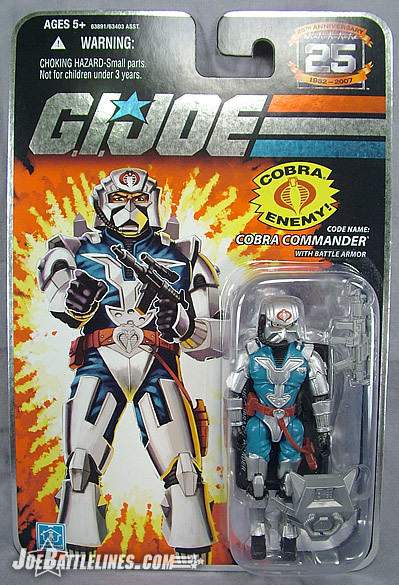 As such, when the Battle Armor version of Cobra Commander was announced in the 25 th Anniversary line, I knew that despite what the card art stated this was really the anniversary version of Fred VII. 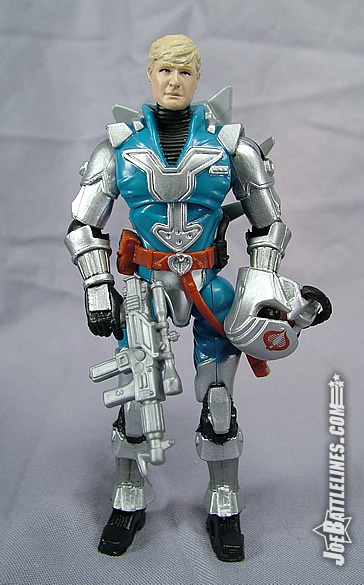 In terms of character design, this figure is a near-perfect update of the 1987 figure, right down to the dated look of the armor. In many ways, this set of battle armor is very evocative of one of Marvel’s signature villains: Doctor Victor von Doom. The battle suit is composed of a cloth-covered torso with a y-shaped armored panel centered on the chest and a ribbed turtleneck style shirt underneath. The arms are completely mechanical in appearance as are the lower legs and give the character design the bulk of it’s armored appearance. The crotch is protected by an armored codpiece in the front and the small of the back is protected by an armored ‘inverted Y” which serves as a mount (presumably) for the armor’s back pack. In other words, Hasbro has done a particularly amazing job at recreating the original character design—right down to the small black hose that runs for the character’s left hip to a panel in the small of the back. It’s a truly amazing piece of work and one of the most faithful translations of an 80’s design into a 25 th Anniversary figure. Of course, I’ll add more on some of the extra details in a moment, after Justin has his say on the basic design of the figure. 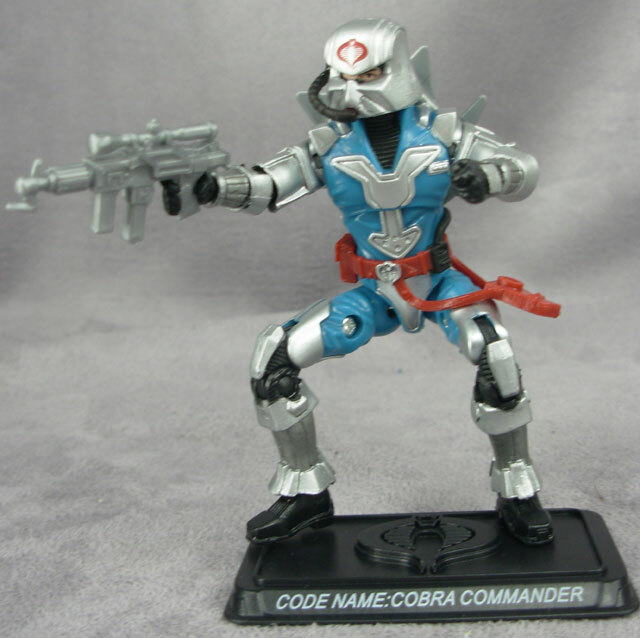 COBRA Commander has always been hit or miss to me when it came to his figure releases. Even though the first two versions are the iconic looks for the character, I’ve never been a huge fan of either one. The concepts are great, but with those early figures, they come off so scrawny and non-imposing that they don’t really do anything for me. The Battle Armor one originally missed the boat for me entirely as well. I’m normally a big fan of the “enhanced bodysuit” idea, wearing a technologically advanced battle suit with enhanced strength and resilience. It’s always been a cool concept, just wasn’t wild about the execution back then. Because of that when I heard this figure was coming out I was not all that happy about it. Thankfully the designers behind the Anniversary line have taken a figure I was never wild about and absolutely ramped it up. This figure is terrific. The combination of armor and polymer mixes perfectly in this new Anniversary style, and I find myself really loving the increased articulation with this figure. 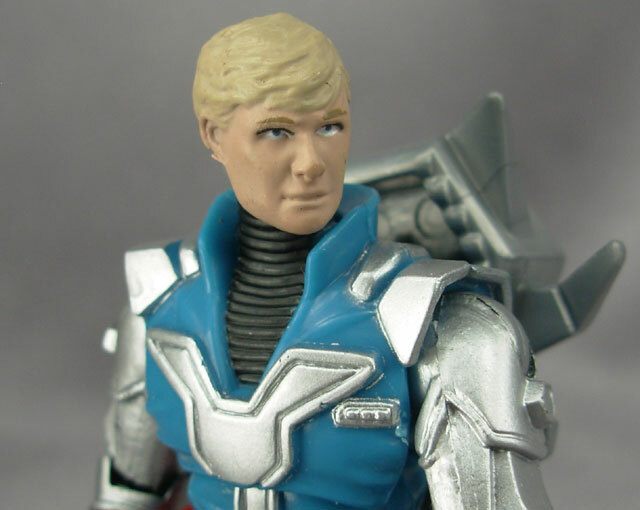 The more advanced sculpting and design techniques these days really allows the designers to go all out and this COBRA Commander looks fantastic. One of the most interesting design aspects of the 25 th Anniversary line has been the use of added accoutrements to complete a particular character’s look. 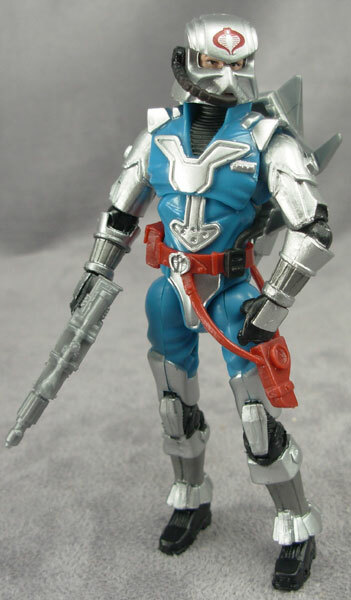 Rock ‘n Roll had his ammunition belts, Flint had his combat harness, and this version of Cobra Commander has his “floating belt” and holster. Originally part of the figure mold, the belt and holster are an added piece that floats around the character’s waist. The only hard connection between this piece and the body is a small port where the molded hose on the left hand side connects into the small of the figure’s back. Like many of the added pieces in the line, the belt is completely removable although doing so would leave the figure’s waist a bit bare in comparison to the rest of the body. 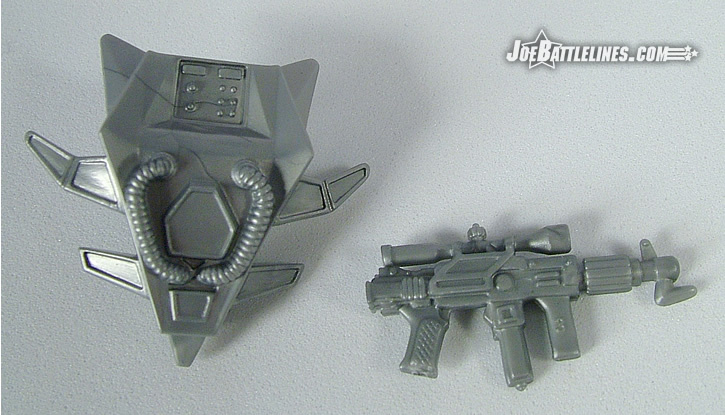 The other removable accessory that comprises the figure’s design is the armor’s helmet. 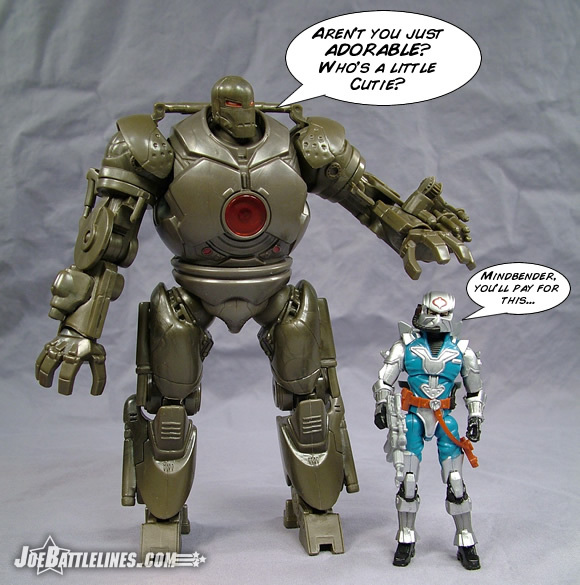 The original figure featured a sculpted helmet which meant that whomever young Joe fans envisioned inside the armor was there for the duration. 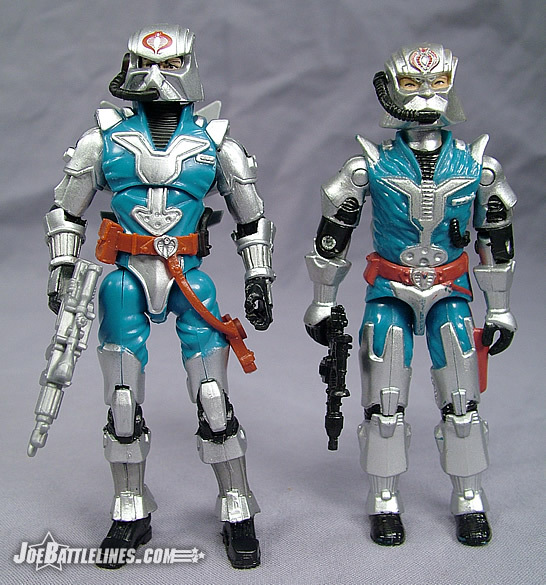 It wasn’t until the GvC era of comic packs that the helm became removable, revealing the Fred series CG inside. That particular helm, however, deviated from the classic toy design and was much more in line with the suit’s comic appearances. 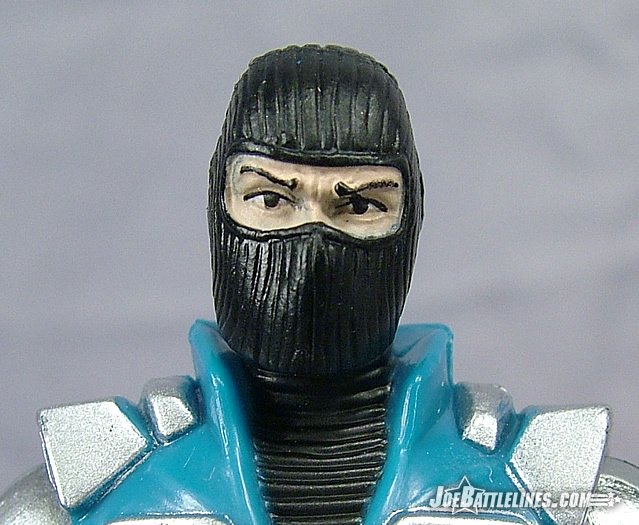 This time around Hasbro has seen fit to flawlessly recreate the original figure design and include a helmet that comes off to reveal a balaclava-clad head. (It’s the 25A Beach Head noggin for those of you keeping score.) The helmet fits the head quite well and even allows for the figure’s eyes to peer forth menacingly through the eye openings. Bravo, Hasbro! You’ve made me a fan of this design after 25 years! I’ll leave the task of describing the accessories up to Justin. (Mostly so I can take a turn being the comic relief to his straight man!) Take it away, General Hawk! Should I just say “me, too” or actually elaborate? The sculpting of his helmet is terrific, the way the angled armored components work into the articulation and the mold of the figure itself is seamless. The double jointed knees work so exceptionally well, and as Fred mentioned those “floating accessories” work so well. Impressive. I would have loved to have seen either a Fred head or the “Beatnik” COBRA Commander head instead of the typical skimask look, but that’s probably picking nits. 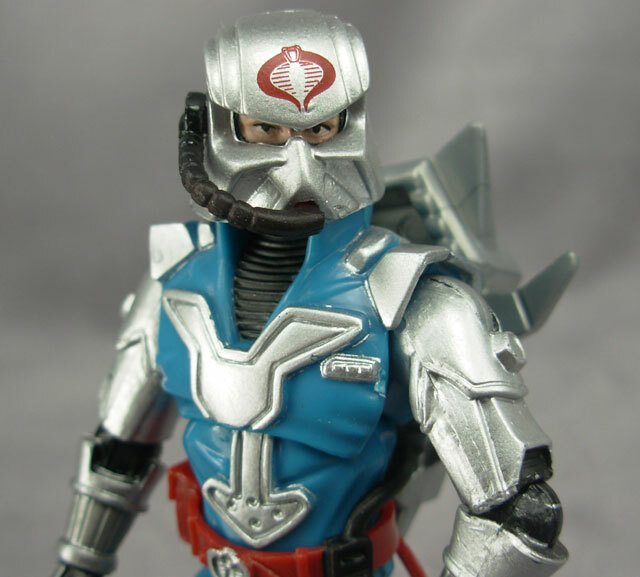 As far as his accessories go, they took the basic designs of the old school ’87 COBRA Commander and really cranked them up. I do find it a bit strange that they enlarged the backpack so much and sculpted it to go on upside down, but it works. The way it connects to the hose is great as well. The removable helmet is done so well that there is really nothing to critique. And his pistol? Perfect. The design was all right back in the day, but current Hasbro designers took the overall design, enlarged the weapon and made it seem more realistic while still keeping the basic look of the weapon. Very, very cool update. It’s amazing but I finally understand the appeal of this figure’s design. It took 25 years and a number of repaints and releases to start the ball rolling but it was the 25 th Anniversary figure that pushed things over the top. This figure is quite honestly THE most faithful update to an original design yet seen in this line. 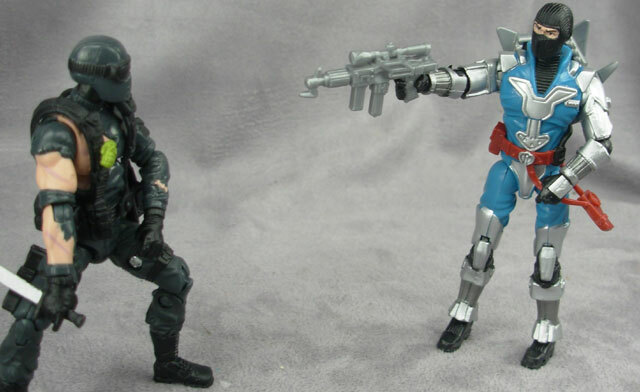 (Only the Iron Grenadier Destro comes close!) I find myself surprised at the amount of original parts molded for this particular figure and can’t help but wonder just exactly how Hasbro will be able to reuse parts from such a distinctive design down the line. However, I’m certainly glad that they put the time and effort into so perfectly capturing the likeness of the combat armor designed by a disheartened Crimson Guardsman so long ago. Quite honestly, as dated as this design is, I can’t help but marvel at just how menacing it can be when given the proper treatment. Consider this a whole-hearted recommendation! It’s amazing how much I’m going to echo Fred on this one…sometimes we come at things from different directions, but in this case we whole heartedly agree. I wasn’t a big fan of this figure or design at first, but the Anniversary version totally converted me. A very pleasant surprise, and a figure I can definitely recommend. GREAT one.